Sir Nils Olav, is an honorary member of the king of Norway’s guard and inspects the soldiers when they visit the Scottish capital. He was knighted in 2008, and subsequently given the new title of Brig Sir Nils Olav. .. .. what would surprise people is that he is not a human being but a Penguin, a military mascot – see the insignia on its body ! In Republic Day parade at Chennai, have seen a decorated goat walking along with police cops. Military mascot refers to a pet animal maintained by a military unit as a mascot for ceremonial purposes or as an emblem of that unit. The custom of adopting mascots originated from troops bringing a pet to war, adopting one at the place they were stationed at or being presented a pet as a gift. Some regimental mascots, such as those of most British infantry regiments, represent their home counties' history. The 102nd Regiment of Foot (Royal Madras Fusiliers) was a regiment of the British Army raised by East India Company in 1742. It saw action at the Siege of Arcot in autumn 1751 during the Second Carnatic War and went on to fight at the Battle of Plassey in June 1757, the Battle of Condore in December 1758 and the Battle of Wandiwash in January 1760 during the Seven Years' War. The regimental pet of the 102nd Regiment of Foot (Royal Madras Fusiliers) was a Bengal tiger cub called 'Plassey'. He was named after Robert Clive's famous victory of 1757, which was also a battle honour of the Madras Fusiliers. Indeed, the cap badge of their regiment also depicted a tiger, a beast much respected for its strength, grace and power. 'Plassey' was one of a pair of tigers captured by Captain Frank Thackwell of the 5th Lancers, and presented by him to the Madras Fusiliers. Legend has it that 'Plassey' was fairly tame and even on friendly terms with the other regimental pets in India, an antelope and a dog. In 1868, after 233 years of Indian service, the 102nd were shipped to England for the first time. 'Plassey' went with them and was certainly well behaved on the voyage home from India, when he was in the company of two young leopards. On arrival, he lived unchained with the garrison at Dover, but apparently alarmed the local inhabitants on several occasions. He was reluctantly sent to the local zoological gardens, where he eventually died. Sir Nils Olav, of the king of Norway’s guard is a King Penguin.The king penguin (Aptenodytes patagonicus) is the second largest species of penguin, smaller, but somewhat similar in appearance to the emperor penguin. King penguins eat small fish, mainly lanternfish, squid and krill. On foraging trips king penguins repeatedly dive to over 100 metres (300 ft), and have been recorded at depths greater than 300 metres (1,000 ft). King penguins breed on the subantarctic islands at the northern reaches of Antarctica, South Georgia, and other temperate islands of the region. Edinburgh Zoo, formerly the Scottish National Zoological Park, is an 82-acre (33 ha) non-profit zoological park in Corstorphine, a suburb of Edinburgh, the capital of Scotland. The land lies on the south facing slopes of Corstorphine Hill, from which it provides extensive views of the city. Built in 1913, and owned by the Royal Zoological Society of Scotland, it receives over 600,000 visitors a year, which makes it Scotland's second most popular paid-for tourist attraction, after Edinburgh Castle. Edinburgh Zoo was the first zoo in the world to house and to breed penguins. It is also the only zoo in Britain to house koalas and giant pandas. Brigadier Sir Nils Olav, a king penguin, resides in Edinburgh Zoo, Scotland. He is the mascot and colonel-in-chief of the Norwegian King's Guard. 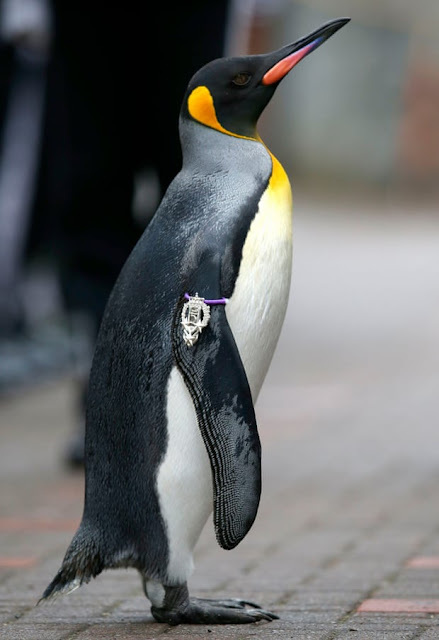 The name 'Nils Olav' and associated ranks have been passed down through three king penguins since 1972 – the current holder being Nils Olav III. Norway – whose explorer Roald Amundsen was the first person to reach the South Pole in 1911 – presented Edinburgh Zoo with its first king penguin at its opening in 1913. When the Norwegian King's Guard visited the Edinburgh Military Tattoo of 1961 for a drill display, a lieutenant named Nils Egelien became interested in the zoo's penguin colony. When the Guards once again returned to Edinburgh in 1972, he arranged for the regiment to adopt a penguin. This penguin was named Nils Olav in honour of Nils Egelien and King Olav V of Norway. Nils Olav was given the rank of visekorporal (lance corporal) in the regiment. He has been promoted each time the King's Guard has returned to the zoo. In 1982 he was made a corporal, and promoted to sergeant in 1987. Nils Olav died shortly after his promotion to sergeant, and his place was taken by Nils Olav II, a two-year-old near-double. He was promoted in 1993 to the rank of regimental sergeant major and in 2001 promoted to 'honourable regimental sergeant major'. In Aug 2005, he was appointed as colonel-in-chief of the same regiment. The next honour was a knighthood, awarded during a visit by soldiers from the Norwegian King's Guard on 15 August 2008. The knighthood was approved by King Harald V and Nils was the first penguin to receive such an honour in the Norwegian Army. During the ceremony a crowd of several hundred people joined the 130 guardsmen on parade at the zoo, to hear a citation from the King read out, which described Nils as a penguin "in every way qualified to receive the honour and dignity of knighthood". There is a 4-foot-high (1.2 m) bronze statue of Nils Olav presented to Edinburgh Zoo. A third penguin, Nils Olav III, took over and in Aug 2016 he was promoted to brigadier.